You'll notice I don't dole out much parenting advice on the blog. That's because I have an almost eighteen month-old and spend most of my days feeling like a complete and utter fraud and failure. I know that sounds depressing, but here is the truth that will set you free: that's what parenting is. 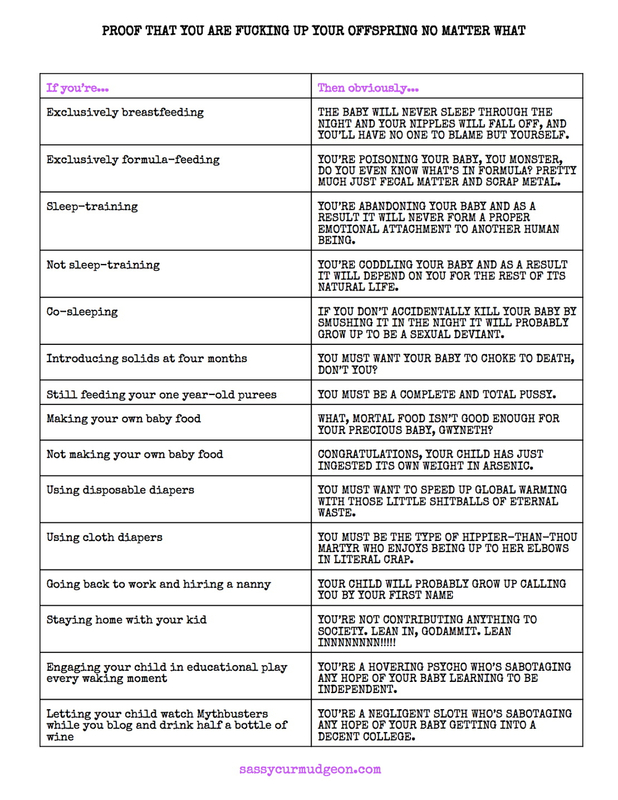 I plan on printing out the above chart and saving it for when my daughter is about 14 or 15, which is when I'm assuming she'll start to realize that her parents maybe weren't/aren't always right. And that, as we raised her, it wasn't that we made the right decision or the wrong decision. It was just that, at 4:20am, when she had been screaming for 80 minutes, and her mom and I were determined to get her back onto The Sleeping Schedule, and we were naked and standing in the dark over her crib, only mostly sure that it was her mouth we were trying to push the pacifier into, both with alarm clocks set for 5am, there was no right decision. There were, and are, only tradeoffs.